SuperStar Rajni is a king among kings in Tamil cinema. From the mid-70s till today, his films draw in crowds all around the South purely because it’s a Rajnikanth film. He is very much Tamil cinema’s Amitabh Bachchan. For those with long memories Rajnikanth did have a brief run in Hindi cinema in which his most memorable role was 1983’s Hum where he starred alongside Govinda and Amitabh Bachchan. 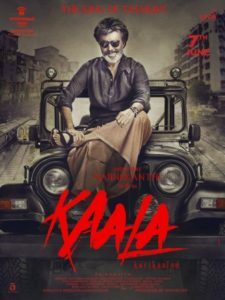 His latest film Kaala is bound to be a fresh super hit in Tamil Nadu cinemas, but as has been the recent trend in films, it has been brought north and redubbed into Hindi to give it a chance to shine amongst the great and good of Bollywood. Co-starring Nana Patekar and produced by Dhanush (from films such as Raanjhanaa with Sonam Kapoor and Shamitabh with who else but Amitabh Bachchan), its also directed by a legend of Tamil movies Pa. Ranjith. To round off this strong team is a lesser known but still legendary music director, Santhosh Narayanan, who has plenty of experience translating his music between languages, most recently Saala Khadoos (starring R Madhavan) and Rajnikanth’s previous superhit Kabali (which was a direct dubbing rather than a remake) for the Bollywood cinemagoers. Thus, the album itself draws on many years of experience and will have both strong singing as well as club beats, but not leaving out the emotional tone and core. The Hindi version of the album begins with Bahut Bhaari Hai. Sung by Rohith Fernandes and Arunraja Kamaraj, this is a loud hip-hop and rap track mixed with some very cool jazz. Acoustic drums, synth sounds and dhol are all employed for beat with bass guitar, trumpet and piano all providing a very live melody over which Rohith, Arunraja and Dope Daddy can spit rhymes. Even though there is a rap break within a rap song, it still manages to find its own space. The only thing that does bring this down a bit is the limitation of the Hindi language which isn’t made for rap in the way that Tamil is, but otherwise even at a solid 5 minutes (which is quite long for any song in the modern style) it holds its head up with pride. Sajna, sung by Ananthu and Shweta Mohan, follows and it is a track with a very sad song feel. Employing heavy but offbeat minor keys, it features acoustic guitar and piano, with heavy strings and a light but effective chorus this is definitely the loss of love song for this film. Shweta Mohan is smooth and stands out in her bit parts for the song, while the rest of the song is balanced between instrumentation and Ananthu. The feel of this song doesn’t have any anger in the loss, it is simply loss. More importantly, that emotion is very much felt in this song. With the heavy song out of the way, Sone Ki Tu Ek Murat is led by Shankar Mahadevan with Pradeep Kumar to lend a hand. As the title suggests this is a fun song for the guy to chase the girl. Harmonium is very much the base with earthen pots and tabla playing a loud beat. Shankar Mahadevan gets full control of how the audience experiences the song with every instrument falling behind him – even allowing him to interrupt the bridge between chorus and verse. Because of it’s lack of synth sounds, it feels more old style but since Rajni is sporting a thick white beard this is not only expected but works well. Tamil cinema films are known for having at least one folk based beat song in which the lead actor will get out his sattai and vetthi onto the street to dance with a group of his best friends and random passers-by. The next song in this album is Nikkal Nikkal to provide just this. The thappatai provides a constant beat. Mumbai’s street language Tapori is heavily used in the lyrics to keep a bright pace on the song sung by Dopeadlicz and Arunraja which they achieve faultlessly. Possibly due to the unchanging nature of the beat, synth sounds are employed to provide the highs and lows behind the singers. The song itself is a short 2:45 but is a very entertaining blend of street cultures during the whole time. For those missing modern beats there is Inqulab Ke Liye, a power play done in heavy synth beats, drums and bass guitar. It is essentially a rap song to open the audience’s eyes to the daily problems of ordinary people and this is something the lyrics promise to fight for. There is a very interesting string procession in the middle ground of this song to allow a little bit of lightness but also to intensify the pride and stoke the fires in people’s hearts. Also, its back to a more usual 3 and a half minutes so this is a good solid power hit. Dharthi Pae Haq Hai feeds back to more classic patriotic songs of the late 90s looking for strong lead choruses backed by tabla and harmonium. Piano and various string instruments are employed to provide the base beat, which is both persistent and is also a driving force within the song. Vijay Prakash is teamed with Ananthu because as they divert from each other about minute 4, Vijay Prakash seems to tangent off into tarana while still staying within the scale of the song and Ananthu keeps driving home the song’s message “Dharti pae haq hai, apna hi haq hai”. This is quite a long song at over 6 and a half minutes, but this is not a bad thing as it certainly doesn’t lose interest and will allow several characters to be involved in the song. Equally this could be used as a background song to some vistas of desperation and people fighting back. Sadkon Ke Deepak is another song back to the rap/hip-hop stylings of Dopeadlicz led by Vijaynarain. A short and sharp song there are 3 types of drums all loud and strong to provide both steady beat and flair. The lyrics very much label this as an every man’s song, showing that while there are daily struggles people find a way to stand up. Finally, the album is rounded off with a proper rock song Ik Sar Waale Raavana. Roshan Jamrock and Arunraja deliver a dark but loud title song for Kaala whose motif is that this Raavan only needs 1 head to take care of business. It’s unforgiving, its powerful, just like Kaala it will hit where it hurts. Just so we don’t forget this is a Super Star Rajni movie, there is a classic whistle sound to just break up the beats a little bit so as to say this is an action man, but he will always be cool. Santosh Narayanan has delivered hit after hit in the south and while he may not be as well known in the north as Illyaraja or AR Rahman, he is still well revered for his great albums. Kaala Karikaalan is no less a statement of the man’s work which employs the power of the rock guitar, the incessant drum of rap lyrics and synth backing sounds without losing any of its Tamil culture. The serious lyrics are given serious beats, the fun ones have fun melodies backing them. There is no sense in the listening of this album that this is anything but a Super Star album, even if it is built for a modern audience.